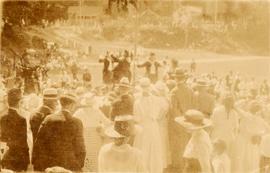 Black and white image of a crowd of people observing dancers while man is playing bagpipe. Photograph depicts wedding portrait of Leo and Bessie Nemetz. Black and white image of Rachel Morris (nee Seidelman) at graduation, perhaps from Normal School. 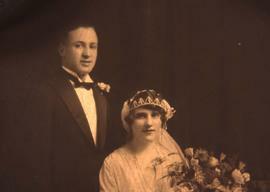 Photograph depicts a wedding portrait of Esther & Ben Dayson, at the first Jewish Community Centre. Photograph depicts Queen Elizabeth during the royal tour in 1939. There is a crowd in the background. It is likely that the photograph was taken when the tour was in Vancouver on May 29, 1939, but it is not certain.